If you know of any other great Saints sites let us know ! Rookie Pierre Thomas scored on a three-yard run in the first quarter, as the New Orleans Saints beat Miami, 7-0, in the final preseason matchup for both teams. Thomas ran for 81 yards and caught two passes for 47 more, as the Saints (3-2) used a dominating defense in a game that had sparse starters for both squads. Antonio Pittman ran for 77 yards in the win. Veteran backup Jamie Martin complete 11-of-15 passes for 136 yards for the Saints, who will open the regular season next Thursday night at Indianapolis. It will mark the first regular season game in the NFL this year with the defending Super Bowl champion Colts hosting the team that was knocked off by the Chicago Bears in the NFC championship game. John Beck connected on 8-of-15 passes for 63 yards and was picked off twice for the Dolphins (2-2), who will start their season at Washington September 9. 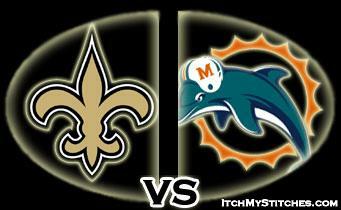 Miami was limited to 121 yards of offense as the Saints came up with four interceptions. Thomas’ 38-yard gain helped the Saints to the game’s only score on the initial drive. Beck drove the Dolphins to the Saints 13 in the closing minutes of the game, but was sacked on third down. He then threw incomplete on fourth down inside of two minutes, and the Saints ran out the clock. Posted in Saints News | Comments Off on Saints beat Miami ! Saints make cuts, down to 75. The New Orleans Saints announced on Tuesday that they have reached the NFL-mandated roster size of 75 players. The Saints parted ways with P Chris Hanson, RB Jamal Branch and WR Jamal Jones. The Saints needed to trim their roster by three players by 3:00 p.m. and will need to reach the NFL roster size limit of 53 players by 3:00 p.m. on Saturday, September 1. Which means they have to cut 22 more people. Posted in Saints News | Comments Off on Saints make cuts, down to 75. This Thursday night in the Superdome ! Who will be the next to be cut from the team ? 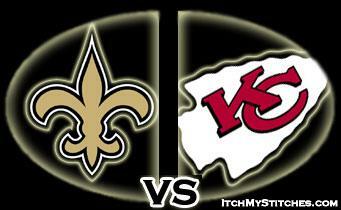 Saints vs Kansas City ! Next on the list Miami ! Went to the 40th Annual, “Meet the Saints luncheon,” sponsored by the Touchdown Club of New Orleans today. First I want to thank the Touchdown Club for putting on a first class event, from start to finish. If you have never been to a “Meet the Saints luncheon” you should try to attend next year. This year the Touchdown Club offered people who attended the luncheon a chance to get “Autographs” which I though made the event even more special. Now to my complaint… and it’s not about any of the players, all of the players went overboard to sign whatever the fans had, hats, shirts, helmets, signs, paintings, you name it anything the fans took up to the players they signed. What I want to know is why some people come up with a “BAG” of stuff to get players to sign; I mean 4 of this, 5 of that and so on. Then these “Fans” get upset when the players do not sign stuff fast enough, or go to the next person without finishing all their stuff. I wonder how many things will end up on eBay later today. I guess I now understand why some players are hesitant about signing things. I had my four year old daughter with me (who went to Jackson, Mississippi and got to meet a few of the players) who wanted to get her ball signed by a few players, and we were knocked over by some people, it really left a bad taste in my mouth for how we “Fans” look towards players. So what do you think, I know players are “stars” and should expect it but when is enough really enough? 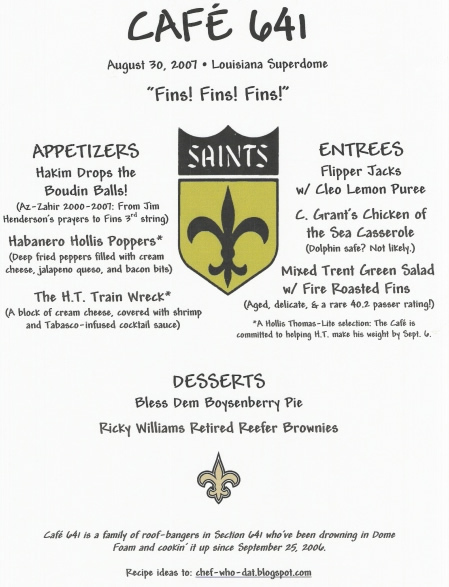 Posted in Who Dat's | Comments Off on Touchdown Club luncheon ! The one thing that is clear about the Saints Quarterbacks is we have a great clear cut number one quarterback in Drew Brees who pulled off an MVP type season last year throwing for over 4400 yards last year. The most unaswered question is who will be our number two if something were to happen to Brees. There are four options the most likely will be Jamie Martin a fourteen year veteran who has a total of eight games in his career. He has been a journey man backup quarterback throughout his career. So far this pre-season he is 17 for 27 with 165 yards through the air appearing in the two of the three games so far. He seemily could not hold onto the ball fumbling three times last week vs the Bengals. Another option is undrafted rookie Tyler Palko who has looked good in training camp and in two pre-season games so far. He is 19 for 35 with 225 yards passing with a touchdown. He showed signs of being a great quarterback as well as showing that he is also very young. He can run and is not afraid to as he is averaging 12 yards a rush. Jason Fife a third option for the spot of Drew Brees’ understudy. He has been in the league for a year and dressed as the teams emergency quarterback from weeks three through six. He looked good in his only pre-season apperance going 5 for 8 with 47 yards passing and threw for the Saints only touchdown in the pre-season opener against the Steelers. The final and most unlikely option is Matt Baker who was added late in camp to give the Saints another option. He spent all of last season on the Dallas Cowboys’ practice squad. He made his pre-season debut against the Bengals going 7 for 13 with 75 yards. The final depth chart will not be out for a few weeks and we will see who will win the battle for the right to backup Drew Brees. New Orleans Saints Gear ! Just got my new Drew Brees jersey in the mail ! Posted in Who Dat's | Comments Off on New Orleans Saints Gear ! boys in black and gold to win one ! Drew Brees had a great game and passed 6 for 6 for 55 yards, and he only played one offensive set, which lead to a touchdown, an 8-yard score by Deuce McAllister. I guess the big question coming up, will be who will be the back up Quarterbacks for the Saints this year ? Tonight we had Jamie Martin, who was 14/19 for 139 yards, and Matt Baker, who was 7/13 for 75 yards ? Or did you like Tyler Palko who was 15/27 for 172 yards last week. And what about Jason Fife, he played against Pittsburgh and was 5/8 for 47 yards. And what about Robert Meachem ? Meachem was a first round draft pick, do you see him being a big part of the team in 2007 ? Well I guess only time will tell. Saints top 10 plays of 2006 ! Who dat.. 2007 is here time for some new plays to be captured on video ! Posted in Videos! | Comments Off on Saints top 10 plays of 2006 !